STAINMASTER™ carpet cushion is the only cushion that features the DuPont™ Hytrel® breathable moisture barrier to keep spills from soaking into the cushion so they can be easily removed during cleaning. STAINMASTER® carpet and STAINMASTER™ carpet cushion form an unbeatable system to keep your carpet fresh, clean and beautiful for years. When spills do happen, STAINMASTER® carpet repels spills and STAINMASTER™ carpet cushion keeps them on top of the cushion so they can be removed completely by extraction cleaning, preventing them from reappearing. Many STAINMASTER™ carpet cushions come with ODOR GUARD technology so the potential of odors is also eliminated. 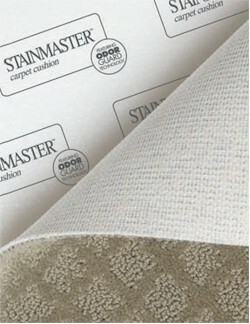 If you install STAINMASTER™ carpet cushion with your STAIMASTER® carpet we’ll extend your STAINMASTER® carpet warranty. By enhancing STAINMASTER® carpet warranties and incorporating advanced technologies, STAINMASTER™ carpet cushion is the perfect complement to your STAINMASTER® carpet to maintain beauty that lasts.